The Mackie 402VLZ4 4-channel features Mackie’s flagship Onyx mic preamps in an ultra-compact design that is an industry-leading performer ideal for professional low-input applications. From every input to every output, the 402VLZ4 is designed to provide the highest headroom and lowest noise possible for maximum signal integrity. 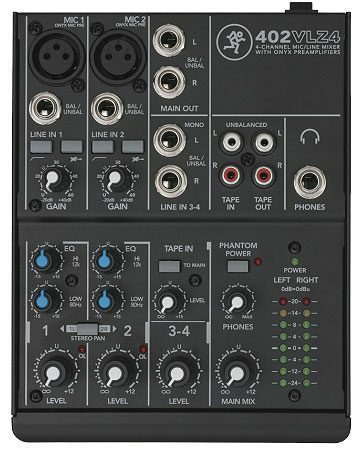 And with features like instrument level inputs, phantom power and level metering, the Mackie 402VLZ4 is the premier mixer choice for anybody who’s big on performance, but light on inputs.